I’m in LOVE with the newest release from Terra over at New Horizons Designs – the 11th Hour Gear (affiliate link). She previewed a sneak peak of this pattern to her testers group waaaay back around Thanksgiving, and I made sure that I kept track of what was going on so I could be sure to carve out the time to join in on the fun. It started out as a basic slim tee and joggers-style bottoms, then evolved into this bucket of options. This really should be the last casual pajamas pattern you need for your kiddos- and it certainly is not limited to PJs. 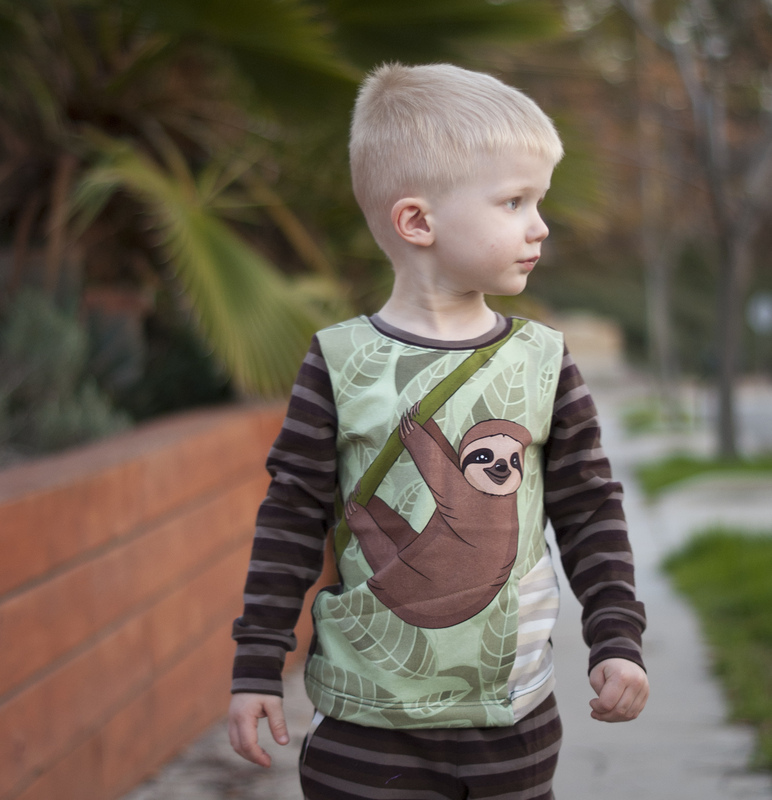 This sloth panel from Starfluffle just about jumped out of the fabric pile and begged to be made into pajamas (and yes, I have an adult sized panel that I will be selfishly sewing soon). The stripes are from Opulent Monsters; I have them in 9 (!) different colorways – and I totally intend to use every last scrap. James is on the small end of the size I sewed up for him so he has some growing room, and he is obviously very comfortable. Even though the pattern is designed and marketed to be pajamas, James demanded to wear this shirt to school the next day and I caved, so into the rotation it goes. The pants, even with pockets, are a little too pajama-y to get away with here, so I’ll be making another shirt to complete the set for him to sleep in.